Loans from Family and Friends: The first port of call for borrowing money for startups is family and friends. 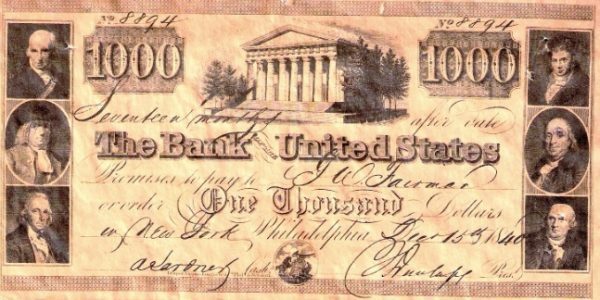 Historically, promissory notes have acted as a form of privately issued currency. They go back to the ancient Chinese dynasties and were introduced to Europe by Marco Polo. The image on the right is of a promissory note of the Second Bank of the United States in 1840. They are not so pretty any more and can be just typed documents, appropriately signed between the parties. Loans from family and friends are by far the biggest chunk of startup finance after the founder’s own investment or personal loans. One study put the proportion at 38% of all startup funding. What ever the proportion is, it’s certainly very significant. However, if you decide to seek loans from family and friends, you must make sure the paperwork is right. While relationship may be enough to get the support, the actual transaction of loans from family and friends must be done correctly, or you will not only endanger the business, but worse, you will endanger those relationships. If you do borrow from family and friends, then the procedure is quite straightforward. You will need to draw up a promissory note to set it down in a legally binding way for both parties. The loan can be secured (against an asset) or unsecured. and, of course, witnessed and dated signatures of all the parties. There are several more to choose from. For a startup you can also choose a convertible promissory notes for loans from family and friends. They may be attractive to people who are not intimate members of your family or more friends of friends than your pals. Such lenders may want to have a chance to participate in the upside of the new venture. The convertible promissory notes are convertible into equity at a later date, depending upon triggers like particular levels of revenue or profit being achieved. To compensate these more arms length investors for the risk they are taking, the notes sold are often convertible at a discount to the price of the next preferred equity round and will also contain a ‘cap’ or a maximum conversion price—on the price at which the note will later convert. There are other routes to funding a startup apart from loans from family and friends. They demand a bit more than making phone calls. The most popular is to use crowdfunding, either using rewards or equity crowdfunding. Rewards crowdfunding involves you in a lots of marketing work and deciding what kind of reward you can offer. Equity crowdfunding is very different, because you are asking for loans family and friends (and perhaps some people you don’t know directly) to make an investment, rather than giving you a gift (rewards crowdfunding), or making a loan that has to be repaid, whether it involves paying interest or not. I have written about equity crowdfunding and produced a short directory of equity crowdfunding platforms. Take a look.